We know Merckens is not able to meet demand and we still need to make our treats, so thank you for finding a great 2nd option so we are back in business. The melting time was shorter, but just as great to work with. THank you! 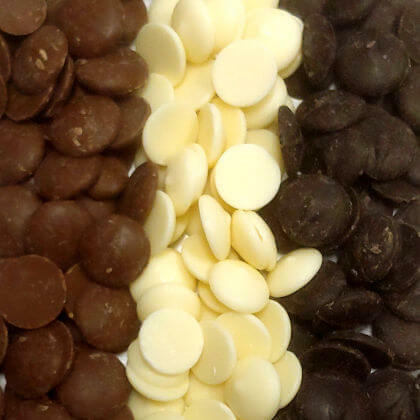 As one of the former owners of The Chocolate Box in Arlington and Cambridge Mass, and 10 time winner of Boston Magazine's "Best of Boston" (1981-1991) for our chocolate truffles, I can honestly say that Merkens Coating Chocolate is the Best! The pricing was competitive and the delivery was great. I live in Arizona and the chocolate came in 3 days, lowest rate on shipping. Will definately order from here next year! My experience with this company was fantastic. not only were the prices competitive, but the customer service is outstanding! I will be a return customer for sure! Product arrived quickly, and was great quality, our wedding guests loved it.